1 Indian Petroleum and Explosive Safety Service (IPESS) CRC meeting held on 09/01/2017. Approval of MoS (PP) and FM have been obtained. Ministry of Commerce & Industry, Deptt. of Industrial Policy & Promotion has to take the approval of Cabinet. MoC&I has moved the Cabinet Note. DoPT's comments thereon are being sent. 2 Railway Protection Force MoR has been requested on 05.07.2017 to place the earlier recommendations of CRC before the Cabinet. 3 Central Industrial Security Force (CISF) Approvals of MoS (PP) & FM have been obtained as per the recommendations of CRC. MHA has moved Draft Note for Cabinet. Comments of DoPT thereon are being sent. 4 Sashastra Seema Bal (SSB) (Group 'A' Combatised) CRC meeting held on 19.7.2017. Approval of MoS (PP) & FM have been obtained. MHA has to take the approval of the Cabinet. MHA has moved the Cabinet Note. Comments of DoPT thereon are being sent. 5 Indian Railways Personnel Service Note for CRC has been sent to Cabinet Secretariat on 04.07.2017. 13 Indian Naval Armament Service (INAS) Certain clarifications were sought from MoD. The same have been received. The proposal is under examination. 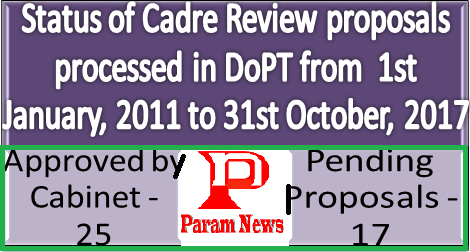 14 Indian P&T Building Works Clarifications on certain points were sought from DoT. The same have been received. The proposal is under examination. 15 Indian Ordnance Factories Health Services (IOFHS) The Proposal was returned to MoD with a request to resubmit as per the Cadre Review Guidelines. Revised proposal has been received. The same is under examination. 16 Indian Economic Service DEA has been requested for certain clarifications vide this Division's OM dated 10.07.2017. 17 Indian Defence Estate Service (IDES) MoD has been requested for certain clarifications. The same are awaited.